Kelly, Brendan D Bracken, Pat Cavendish, Harry Crumlish, Niall MacSuibhne, Seamus Szasz, Thomas and Thornton, Tim 2010. The Myth of Mental Illness: 50 years after publication: What does it mean today?. Irish Journal of Psychological Medicine, Vol. 27, Issue. 01, p. 35. Szasz, T. (1962) The Myth of Mental Illness. Foundations of a Theory of Personal Conduct. London: Secker & Warburg. Please note that we have been made aware of a campaign to organise submission of letters in response to the book review by Raj Persaud. As stated in our guidelines we will only publish letters that contribute substantially to the topic under discussion. Letters that make the same points as letters already published will not be accepted. I sensed a glimmer of truism when Raj Persaud asked, in his review of"Liberation by Oppression: A Comparative Study of Slavery and Psychiatry" by Thomas Szsaz [(March), 2003], "Isit not possible that [a voluntary mental health system] could be a lot more positive for both clinician and patient?". Yet, upon full reading ofthe doctor's review, I was saddened to find little of the books prominent points, that have been historically contended by Dr. Szasz; well, I might add! For example, Szasz would agreethat, "A 21st century science of mind needs to incorporate the findings of quantum physics and knowledge of non-physical realities into the understanding of mental health and mental illness." ~Dr. Andrew Powell! Client-centered therapeutic centers that actuate, for example! Why didn't the reviewer bring up that the A.P.A. and the medical model have fallen woefully short in their chargeto help to heal mental health needs of our people! Counter-transference as practice, through substituting behaviorism for psychology, has determined human suffering and an exacerbation of mental health needs in our society! Most psychiatrists and mental health professionals have forgotten the first tenet of the Hippocratic oath, "to do no harm"! The latest trends toward almost archaic interventions, such as electroshock, involuntary long-term seclusion, forced medications, are abominations not progress! Yet, we also have to address the facts that the medical business is primarily market driven, and social responsibility isn't what drives markets. They make their money on patriarchally intervening in "their patients", lives, usually with detrimental effects, for the societyatsmall. This necessitates a restructuring of the medical business, so dividing and conquering its patients isn't the most efficacious way for them to make money. Though, the newly resurgent sales pitch for mass consumption of psychiatric supposed quick fixes, and similar behaviorists interventions is directly aimed at thwarting these evolutionary efforts. We, as humans, can't allow this! This analysis is what Szasz is known for, and is in his recent release; yet, the reviewer seems to be satisfiedwith purporting a chiding of society for its criticism of psychiatry is a substitute for a well rounded review. Raj Persaud's review of "Liberation by Oppression: A Comparative Study of Slavery and Psychiatry" is bewildering to one who has read the book and is familiar with Thomas Szasz's critique of psychiatry. Szasz's central point is blinding in its simplicity, or it must be since Persaud and so many mental health professionals are unable to see it. This point is that psychiatry's foundation, based as it is on coercion, is morally corrupt. Szasz the abolitionist opposes psychiatric slavery -- "treatments" imposed on unwilling persons-- as William Lloyd Garrison opposed chattel slavery. As Garrison denounced the whip, Szasz denounces the tools of psychiatric oppression: drugs, confinement, and thesordid array of tortures masquerading as treatments that live in psychiatric infamy. Contra Persaud, Szasz was never in the "anti-psychiatry movement," and has denounced those associated with it, notably R.D Laing, who himselfemployed psychiatric coercion. His aim is not, as he says, to "prettify the plantation" by making the methods of psychiatric oppression more commodious for perpetrator and victim. It is to end the pretense that psychiatrists know what's good for their patients and should give it to them good and hard, and against their wishes. Most appalling is Persaud's Orwellian claim that Szasz is now an "ally" of the National Health Service general adult psychiatrist. What nonsense! The libertarian Szasz not only opposes the psychiatric tortures routinely employed by NHS psychiatrists, but he opposes socialist health care on moral and economic grounds. Rather than providing Persaud's metaphorical "lifebelt thrown to a drowning man" --the psychiatrist who copes with the difficulties of slavemastering-- Szasz would likely prefer the master to drown so that his slaves might be emancipated. Persaud claims that "Szasz blames psychiatry for forms of thinking that the rest of society is equally guilty of." It is true that Szasz, like any astute observer, knows that humans are fallible. It is the violent imposition of psychiatrists' delusionary infallibility on the restof society that he deplores. Astrologists pretend to know the unknowable about stars and fate; psychiatrists pretend to know the unknowable about brains and behavior. The obvious distinction is that astrologists do not then get an order of commitment against their voluntary clients. A damningastrological chart might incite consternation, but a damning psychiatric chart can get you locked up for a lifetime. Szasz might be delighted if psychiatrists rose to the ethical level of astrologists. Persaud ends with the preposterous, and again Orwellian, contention that freeing the psychiatric slaves, as Szasz demands, would demonstrate how much the slaves need their medical masters to "assist in the management of those who appear unpredictable, suffering and insightless." The same argument was made about black slaves, who were supposedly doomed to ruin if emancipated. Unsurprisingly, the mad doctors diagnosed fugitiveslaves as suffering "drapetomania," the pathology of wanting freedom. 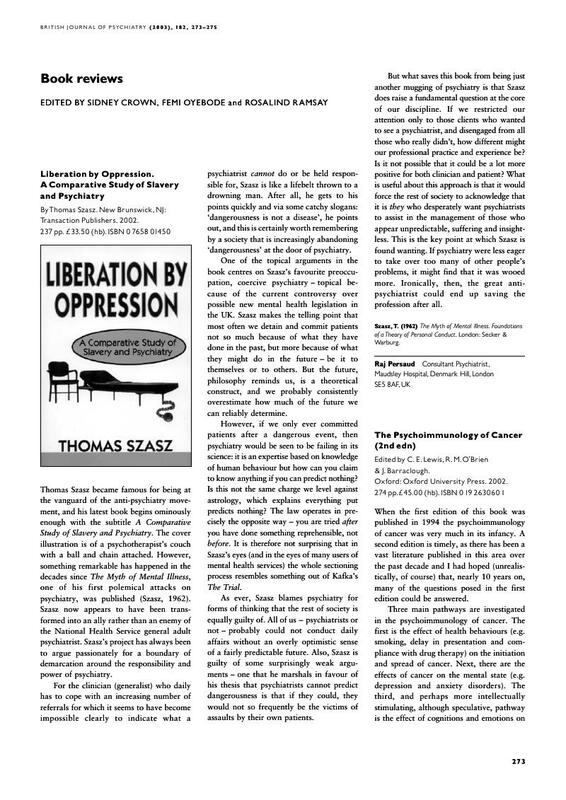 Raj Persaud begins his review of Thomas Szasz's book Liberation by Oppression: A Comparative Study of Slavery and Psychiatry by asserting that something false is true: "Szasz became famous for being at the vanguard of the anti-psychiatry movement." (1) Szasz has never been part of the "anti-psychiatry movement," much less at the vanguard of it. (2) There is as much truth in Persaud's assertion as there is in asserting that the Nazis were simply practicing medicine. Szasz has made it absolutely clear for over fifty years now that he supports psychiatry between consenting adults, that is, he supports contractual psychiatry. (3) Dr. Persaud then asserts that Szasz is an "ally rather than an enemy of the National Health Service general adult psychiatrist." This is another fiction masquerading as fact. Szasz is not an ally of National Health Service psychiatrists, none of whom, to my knowledge, has denounced or renounced the practice of psychiatric slavery.Moreover, Szasz is a classical liberal, not a socialist. The two cardinalprinciples of the classical liberal credo are the affirmation of the rightto bodily and mental self-ownership and the prohibition against initiatingviolence. These rather serious misrepresentations aside, Persaud ignores the core ideas in Szasz's book. Institutional psychiatry is an extension of law: Institutional psychiatrists are agents of the state, not of their patients. Doctors who practice contractual medicine are agents of their patients, not of the state. The importance of this difference cannot be overemphasized. People labeled by institutional psychiatrists as mentally ill are concurrently defined by the courts as less than human, in much the same way negroes in America were once defined as three-fifths persons. This is hownegroes were, and the mentally ill are, deprived of liberty and justice bythe state. Labeling negroes and the mentally ill as less than human is legal fiction, something false that is asserted as true, that the courts will not allow to be disproved. Just as defining negroes as three-fifths persons served to maintain the institution of slavery, defining people as mentally ill serves to maintain the institution of psychiatry. A person has a right to refuse treatment for cancer. A person does not have a right to refuse treatment for mental illness. If institutionalpsychiatrists are deprived of their power by the state to deprive mentallyill persons of liberty, that is, if the state did not allow psychiatrists to enslave their patients in the name of liberating them, institutional psychiatry would go the way of slavery, as well it should. Where are voices of psychiatrists who supposedly oppose coercion in the mental health field? Unfortunately, rather than simply answering his own question in the affirmaive as I had hoped he would, the reviewer rapidly appeared to offer the psychiatric profession a kind of insanity defense for its historic complicity with forced psychiatry. Dr. Persaud appears to claim that a significant number of psychiatrists are personally reluctant to engage in forced procedures. He seemed to excuse the psychiatric profession by pointing out that it is society that “desperately wants” involuntary procedures to manage troublesome citizens. While many individual psychiatrists may look at forced procedures with distaste, the fact remains that with few exceptions psychiatrists and their organizations have been far too silent about opposing forced psychiatry, and they have often endorsed and actively campaigned for laws allowing more forced procedures. For example, involuntary psychiatric drugging is a fact of life internationally, and the practice is now spreading in some countries to an outpatient basis using court orders. Also, electroshock (also known as electroconvulsive therapy) against the expressed wishes of the subject continues to this day, and our office has heard several anecdotal reports that this especially horrifying and intrusive practice is increasing in developing nations. Both forced drugging and forced electroshock are endorsed by many organizations of psychiatric professionals, except for a few courageous exceptions such as the International Center for the Study of Psychiatry and Psychology . I feel privileged to direct a Non Governmental Oragnization -- Support Coalition International -- that frequently works with some of the few psychiatrists who speak out against involuntary human rights violations in the mental health system . Rather than giving society the lion’s share of the blame for the continuation and spread of forced treatment, psychiatrists and their organizations need to take responsibility for their own role, and end these severe human rights abuses now. As requested by your guidelines, this is a declaration that I have no self interest or conflict of interest in the publication of this letter, including no fees and grants from, employment by, consultancy for, shared ownership in, or any close relationship with, and organisation whose interests, financial or otherwise, may be affected by publication of the letter.